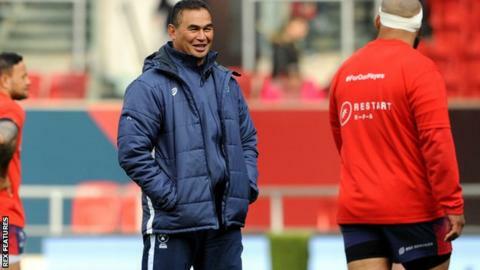 Bristol Bears are still striving to qualify for next season's European Champions Cup with a top-six finish this term, says head coach Pat Lam. Lam's side beat second-placed Saracens on Saturday to boost their Premiership survival hopes and move five points below sixth-placed Northampton Saints. With three games to go, ninth-placed Bears, who were promoted in 2018, are 11 points above bottom side Newcastle. "Top six, that's what we're aiming for," Lam told BBC Radio Bristol. "Until we're mathematically told we're not going to make the top six, we're still striving for it. "From our own learning and our own growth, we should be in the top six. But that's just me being impatient. Sometimes you have to go through the pain to actually appreciate being in there. "So the way we look at it, there are three more games, the next one is Leicester, and there's another five points, and then you move on to Sale and Newcastle, and if we can get those jobs done then who knows." Bristol travel to Leicester Tigers on 27 April, before Friday, 3 May's home game against Sale Sharks and then a trip to struggling Newcastle Falcons on the season's final day, 18 May. The Ashton Gate club have won seven of their 19 league games this term, which is already four more than they managed to win during their most recent relegation season of 2016-17. They have not featured in Europe's top club competition since the 2007-08 campaign.